A powerful Pacific storm covering the entire length of California knocked out power for thousands and threatened dangerous mudslides in communities near mountains stripped of protective foliage by drought-fueled wildfires. A nine-mile stretch of the Pacific Coast Highway was shut down until noon (3 p.m. ET) Friday because of the potential for rock and mudslides. Authorities ordered mandatory mudslide evacuations for more than 1,000 residents of several communities in the foothills of the San Gabriel Mountains, which were expected to get as much as 8 inches of rain through Saturday — in an area where the Colby Fire in January destroyed ground cover and trees that could hold back the mud. “It could come apart days from now or months from now,” said Dave Malkoff, a meteorologist for The Weather Channel. “If you choose to not heed those mandatory evacuations, you must understand something: As long as the mud is flowing, the fire department cannot get to you,” Los Angeles County Assistant Fire Chief Steven Martin said. Runoff in the Los Angeles River near Dodger Stadium swept away two people and their dogs, who had to be rescued by the fire department’s swift water rescue team Friday morning. As firefighters in California are fighting surging waters from torrential rain, the risk of dangerous mudslides is increasing. Cleanup underway along the southern coast of California after flooding and mudslides. This video introduces CA Flood preparedness week. This was the flash flood in mill creek, 9-7-13, We had hiked across mill creek earlier in the day when it was just 2-3 feet wide. 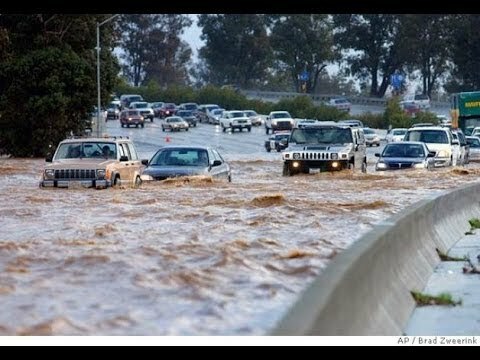 California FLOOD ALERT – 2012!! !